I've had this felt for the longest time, but for some reason, I was afraid to cut into it. Somehow I felt like I would ruin it or something. It's not like they were never going to make any more--sheesh. Anyway, today I decided to get over my reluctance to use it. And here's what I came up with. I started with a piece of white stock which I embossed and then rounded the upper right corner. I cut the black polka dot frame (using two different sized Classic Circles dies from Spellbinders nested together) and adhered it to the embossed piece. The sentiment was stamped on a leftover label, and I added a few leaves and flowers stamped in black and colored in. It was popped up on dimensionals. The felt flowers and leaves were cut using a die from PaperTrey. It cut smoothly and easily and I loved the final result. I added buttons tied with floss to the centers and adhered them to the card using Score-Tape. Then the card front was mounted to a black base. I don't know why I waited so long to cut into this felt, but I know I won't wait so long to try it again! Are you hoarding products you're reluctant to tear into? Go ahead and use them. They'll make more, I promise. I LOVE this card! The felt flowers & leaves are fabulous and the stamped flowers & leaves are colored to perfection. 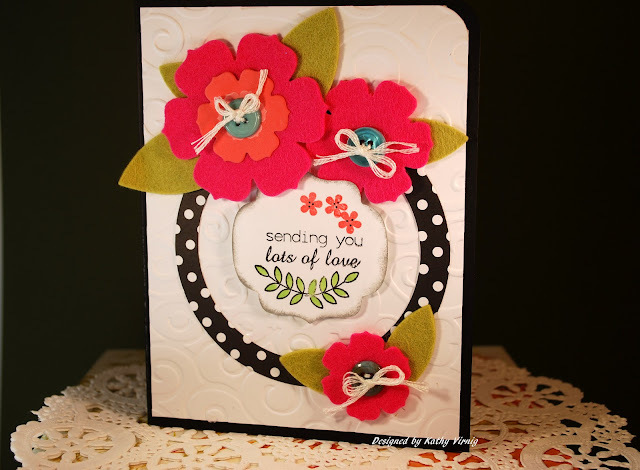 Love, love, LOVE the bright cheery colors of this card. I've had felt on my wishlist for a while, but can't decide what color(s) to buy first, so I haven't bought any lol. Lovely, as always! Did you just use regular felt, like for crafts, or is it heavier? I'm always buying felt embellishments and never think to cut them myself..you're a genius! wow, your cards are beautiful!!! I am so excited to be a new follower and to hopefully learn a thing or two from you! Just beautiful! Hi Kathy! I have given you a Liebster Blog Award! Please visit my blog at: http://cardcraftyclub.blogspot.com/2012/04/v-behaviorurldefaultvmlo.html to learn more! Thanks!!! Ah the flowers are so pretty! PTI felt looks amazing! It was so fun meeting you Kathy!